1911 Encyclopædia Britannica. 11th edition, Volume 10, Slice 5. Accessed online, http://www.gutenberg.org/files/35747/35747-h/35747-h.htm. Adams, Ross Exo. To Fill the Earth: Circulation and Urbanization, MPhill diss., Birkbeck, 2014. Biggam, Carol P. ‘Grund to Hrof: Aspects of the Old English Semantics of Building and Architecture.’ Architectural History no. 45 (2002):49-65. Booth, Barbara, Stephen D. Murphy, and Clarence J. Swanton. Weed Ecology in Natural and Agricultural Systems. Cambridge, MA: CABI Publishing, 2003. Cacciari, Massimo. ‘Metropolis’, in Architecture and Nihilism: On the Philosophy of Modern Architecture. New Haven: Yale University Press, 1993. Castells, Manuel. ‘Grassrooting The Space Of Flows.’ Urban Geography 20, no. 4 (1999): 294-302. Castells, Manuel. The Rise of the Network Society. Oxford: Wiley-Blackwell, 2010. Corner, James. ‘Terra Fluxus’, in Charles Waldheim ed., The Landscape Urbanism Reader. New York: Princeton Arch. Pr., 2006, 21-33. Corner, James, and Alex S. MacLean. Taking Measures across the American Landscape. New Haven: Yale University Press, 1996. Dripps, Robin. ‘Groundwork’ in Burns, Carol, and Andrea Kahn, eds. Site Matters Design Concepts, Histories and Strategies. New York: Routledge, 2005, 59-92. Easterling, Keller. Enduring Innocence: Global Architecture and Its Political Masquerades. Cambridge, MA: MIT, 2005. Easterling, Keller. Extrastatecraft: The Power of Infrastructure Space. London: Verso, 2014. Easterling, Keller. ‘Floor.dwg.’ Cabinet, no. 47 (2012): 98-101. Elderfield, John. Imagining the Future of the Museum of Modern Art. New York: Museum of Modern Art, 1998. Foufas, George, and George Papam. ‘Public Works of Infrastructure.’ Log, no. 39 (2017): 95-96. Frey, Carl Benedikt, and Michael A. Osborne. ‘The future of employment: How susceptible are jobs to computerisation?’ Technological Forecasting and Social Change 114 (2017): 254-80. Ghosn, Rania. ‘Move Along! There Is Nothing to See’ Thresholds MIT Journal 40 (2012): 33-38. Hanley, Richard. ed., Moving People, Goods, and Information in the 21st Century. New York: Routledge, 2004. Harvey, David. ‘Space as a Key Word’ in Spaces of Global Capitalism: Towards a Theory of Uneven Geographical Development. London: Verso, 2006, 117-148. Higgins, Andrew. ‘China’s Ambitious New “Port”: Landlocked Kazakhstan.’ New York Times, January 1, 2018. https://www.nytimes.com. Jetter, Clay, dir. ‘Dan Barber.’ In Chef's Table. Netflix. February 12, 2015. Kotionis, Zissis. Multidomes: Multitude, Commons, and Architecture. Edited by Yorgos Tzirtzilakis. Volos: University of Thessaly Press, 2012. Lay, Maxwell G. Ways of the World: A History of the Worlds Roads and of the Vehicles That Used Them. Sydney: Rutdgers University Press, 1992. LeCavalier, Jesse. ‘The Restlessness of Objects.’ Cabinet, no. 47 (2012): 90-97. Lines-Kelly, Rebecca. ‘Soil: Our Common Ground – a Humanities Perspective,’ proceedings of SuperSoil: 3rd Australian New Zealand Soils Conference, University of Sydney, 5-9 December 2004. Lyster, Clare. Learning from Logistics: How Networks Change Our Cities. Basel, Berlin: Birkhäuser, 2016. Mumford, Lewis. The City in History: Its Origins, Its Transformations, and Its Prospects. London: Secker & Warburg, 1961. Naylor, Robert E. L. ‘What is a weed?’, in Naylor, Robert E. L. ed. Weed Management Handbook. Oxford: Published for the British Crop Protection Council by Blackwell Science, 2002, 1-15. Oreopoulos, Filippos. ‘The Terrain.’ Proceedings of RR Radical Reading #1, Athens School of Fine Arts, Athens. 2016. Rancière, Jacques. ‘Ten Thesis on Politics.’ Theory and Event 5, no. 3 (2001): 8.22. Marchi Producioni. New York: MoMa, 1972. Tafuri, Manfredo. ‘Design and Technological Utopia’, in Ambasz, Emilio. Italy: The New Domestic Landscape; Achievements and Problems of Italian Design. New York: Distributed by New York Graphic Society, Greenwich, Conn., 1972. Toscano, Alberto. 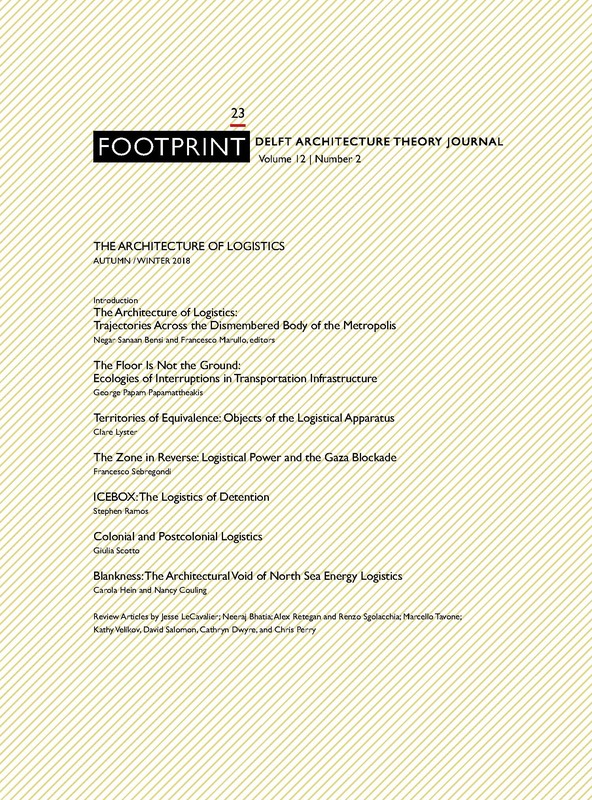 ‘Logistics and Opposition.’ Mute, August 9, 2011. http://www.metamute.org. George Papam Papamattheakis is a postgraduate student of Urban Geography at the Harokopio University in Athens, Greece. He previously studied Architecture at the schools of National Technical University of Athens (NTUA) and Eidgenössische Technische Hochschule (ETH) in Zurich. George has worked on issues related to the architecture and geography of infrastructures, he has contributed to Log,Clog and Cartha magazines, the Lisbon Biennale of Architecture, and Bartlett’s Lobby. He is the co-editor of the upcoming book Misprint Athens: Toward a New Paradigm (due 2019, published in Greek), a collection of texts and projects documenting the procedures of ΣΟΔΑ, a collaboration platform for graduate architecture students in the context of post-crisis Athens. PAPAMATTHEAKIS, George Papam. The Floor is not the Ground. FOOTPRINT, [S.l. ], p. 7-24, nov. 2018. ISSN 1875-1490. Available at: <https://journals.open.tudelft.nl/index.php/footprint/article/view/2040>. Date accessed: 21 apr. 2019. doi: https://doi.org/10.7480/footprint.12.2.2040.